The 2005 Renwood Old Vine Zinfandel is a great expression of what Zinfandel in this price range can be. For $15 it shows lots of dark fruit and “raisiny” goodness without being overly jammy or extracted. Great spiciness through the whole palate and firm tannic structure help balance out the fruitiness of the wine. Although a great value Zin, it may be a bit much for an everyday drinker but would great with pizza, barbecue, or grilled foods. “HRW” is a fairly new line of wines from Hendry that offers some value to their brand, priced at around half of what the big brother costs. The wines are blends of the leftover juice from their single block wines, that for whatever reason wasn’t “good enough”. 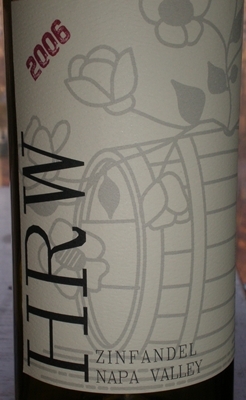 The 2006 HRW Zinfandel ( $18 ) is a blend of juice from their Block 7&22 and the Block 28 Zinfandel. The wine was fermented in stainless steel tanks and aged in French Oak for 12 months. Approximately ten percent of the oak was new with the remaining being one, two and three year old Zinfandel barrels. We drank this with some grilled food and redskin potato salad during this unseasonably warm weather Richmond was having this weekend. The pairing worked out well with the smoky notes really coming out with the smokiness of the grilled food. I really enjoy the Hendry “Zins” but have a hard time popping a $30-$40 bottle of wine on a daily basis or to have at a cookout. The HRW line gives you the quality you expect from Hendry with slightly less complexity, in a rocking Napa Zin. I usually don’t buy wines from Sam’s Club, I like to give my wine business to the local shops around town versus the big guys who don’t “need” my business. But the other day I picked this up for the fun of it. We had this with some awesome veggie pizza from Angelo’s in Midlothian. It was a great pizza wine, lots of layered fruit and lush round mouthfeel. The 2005 MonteVina Terra d’ Oro Zinfandel was very fun, good structured Zin with a splash of acidity that wasn’t overly extracted or to “big” for its britches. It’s got a lot of distribution so you should be able to find it just about anywhere. This came in our May Seghesio club shipment and is one of their Zinfandels that is only offered to wine club members. Enrico Prati immigrated to Asti California in 1910 and in 1914 he married Ida, the daughter of Edoardo and Angela Seghesio. The Prati family has been growing grapes in Alexander Valley for over 90 years, allowing this vineyard to experience four generations of love for grapes and wine. The 2005 vintage from the Prati vineyard was harvested on October 8th and had a final alcohol level of 15%. The 2005 Prati Vineyard Zinfandel was then aged for 10 months in 75% American Oak and 25% French Oak. We always love the Seghesio Zins which is why we are members of their wine club, especially because we can get special access to single vineyard wines. The Prati is another great example of why Seghesio is such a well respected winery. The multiple layers of flavor and texture wrapped in a well balanced package for just over $20 made for a great wine at a great price. Add this post to your favorite Social Bookmarking site by clicking the icons below.